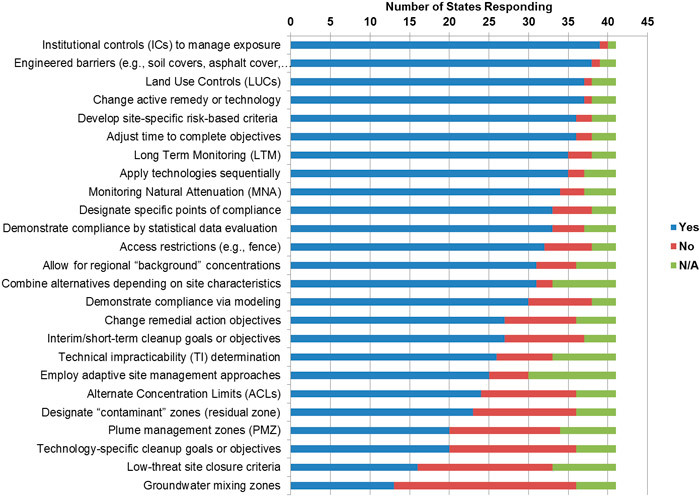 A remediation potential assessment can be used to decide whether adaptive site management is recommended due to site challenges identified within the context of the CSM. The adaptive site management approach may be adjusted over the site’s life cycle as new site information and technologies become available. This approach is particularly useful at complex sites where remediation is difficult, the remediation potential is uncertain, and the remediation may require a long time. Refine the conceptual site model. These steps are particularly relevant at sites that are selecting an interim or final remedy or revisiting the existing remedial strategy because insufficient progress has been made towards meeting site remediation objectives. These elements can be used iteratively during the adaptive site management process (Figure 1). This process is eventually guided by the long-term management plan, which should be anticipated during remedy selection and implementation. It is particularly important to revisit and refine the CSM periodically throughout the project life cycle. The CSM should be treated as a dynamic tool and updated as needed (for example, by using data generated during implementation of adaptive site management) to support remedy decisions throughout the adaptive site management process. It is a best practice to update the CSM during long-term management planning, remedy implementation, periodic evaluations of monitoring data and remedy performance data, and remedy optimization. If a remedy is not on track to meet interim objectives despite optimization, the CSM should be refined prior to revisiting the remedy (Figure 1). If additional site characterization is needed to fill data gaps and complete an effective remedy design, an integrated site characterization (ISC) process can improve site characterization and maximize the effectiveness of remediation (ITRC 2015b). Although it was developed for use at sites with DNAPL, the ISC process can be used at other sites as well. The ISC process is shown in Figure 2. Figure 2. ISC approach (ITRC 2015b). 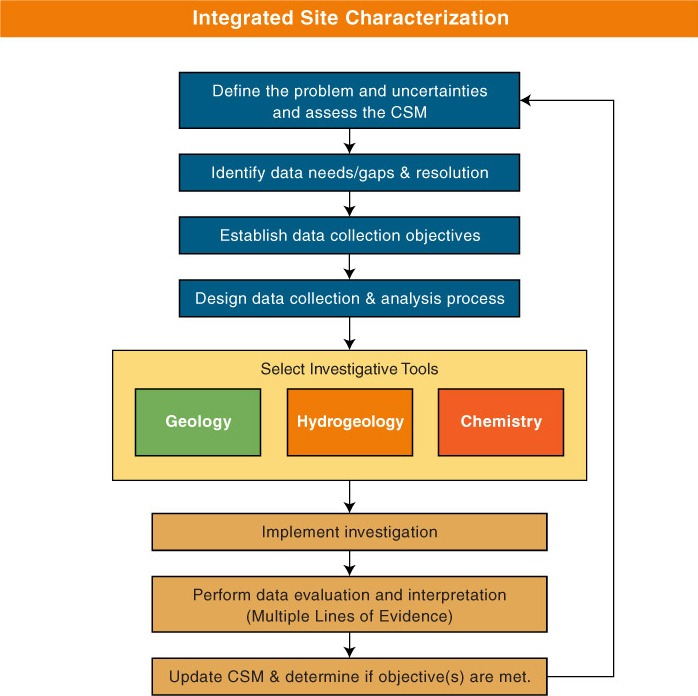 The ISC supports iterative refinement of the CSM over the project life cycle with information obtained during site investigation, remedy design, and remedy optimization. Similar to the USEPA’s data quality objectives (DQOs), it relies on a systematic, objectives‑based site characterization process that includes defining the uncertainties and CSM deficiencies; determining the data needs and resolution appropriate for site conditions; establishing clear, effective data collection objectives; and designing a data collection and analysis plan. Through ISC, the most appropriate and up‑to‑date site characterization tools are selected to effectively characterize site geology (for example, stratigraphy), permeability, and contaminant distribution. Once the data are collected, the process includes evaluating and interpreting the data and updating the CSM. Note that additional site characterization may show that some sites are more complex than initially thought. For example, fractured bedrock poses challenges for mapping groundwater flow paths. More detail on characterization in fractured rock environments is provided in recent ITRC guidance (ITRC 2017a). When refining the CSM, using GSR approaches (ITRC 2011a) to investigate the site can result in a quantitatively greener project by consuming fewer resources and by producing lower emissions and wastes. GSR can effectively bring stakeholders into the project so that their views and needs are reflected throughout the site remediation process. Investigation phase GSR options can be identified or implemented using a tiered approach ranging from very simple (best management practices) up to very sophisticated analysis (life cycle analysis). Site characterization and CSM development is inherently complex at an industrial site in Australia, where over 100 metric tons of mixed chlorinated organic compounds were released into a variably weathered, fractured basalt aquifer. The CSM has been developed iteratively using an observational and adaptive approach for fractured rock sites recommended by NAS (2015). Site characterization approaches include long-screen monitoring wells, aquifer testing, basalt cores, rock crushing and extraction and analysis of VOCs in rock core samples, and FLUTe liners in open boreholes to test for DNAPL presence. Several remedial technologies were tested at scales ranging from laboratory microcosms to field pilot studies. Microbiological tools (QuantArray), passive flux meters, bioaugmentation, and compound specific isotope analysis were used to evaluate an ongoing enhanced in situ bioremediation remedy, optimize remedy performance and evaluate methods of accelerating DNAPL removal. More details are provided in the full case study. Site objectives must be determined before considering remedial strategies to achieve those site objectives. Site objectives are established based on remediation expectations and requirements for sites in CERCLA, RCRA, and other state and federal programs. Different regulatory programs may have different levels of flexibility in setting and revisiting site-specific objectives. These objectives are usually considered during remedy planning or when remedy performance is not sufficient to achieve site objectives within the expected time frame. In this document objectives are defined as either absolute [site] or functional [interim] (NRC 2005, ITRC 2008b). Absolute [site] objectives are based on broad social values, such as protection of public health and the environment. Functional [interim] objectives are the steps or activities that are taken to achieve absolute [site] objectives. The IDSS guidance also provides references to examples of alternative objectives that can be used in specific instances, such as technical impracticability waivers, ACLs, and plume containment approaches. Site and interim objectives need not be the same throughout the site. For example, off-site contamination, source areas, and plume areas may each require different objectives, remedial strategies, and remediation time frames. One challenge at complex sites is how to identify and consistently use various regulatory approaches within their specific regulatory programs. Although some programs (particularly many state petroleum programs) permit flexibility in site objectives to achieve pragmatic results, site objectives other than MCLs are often perceived as less desirable and remain controversial to even discuss with many regulators. At other sites, regulators have recognized that MCLs for groundwater are not an appropriate target and have approved ACLs or other site objectives for groundwater. For example, the use of non-MCL site objectives at a site with no present or future potable use has the potential benefit of reducing the remedial time frame. State programs may include nonpotable aquifer designations with non-MCL water quality standards or allow use of ICs and a designated point-of-compliance for MCLs (such as at an affected property boundary or at a point of use). CERCLA and RCRA programs have formal regulatory definitions of ACLs and other types of regulatory flexibility in setting site objectives. These regulatory approaches, if appropriate, may establish site objectives that are higher than the MCL, yet protective under the site-specific conditions. In addition, because sites with complex attributes often will not achieve objectives within a reasonable time frame, site-specific interim objectives, as discussed in Section 4.4, must be developed so that remediation management can be implemented to protect human health and the environment over the long term. The type of remediation program (such as CERCLA, RCRA, or other state regulatory agencies overseeing site remediation) prescribes the approach to defining and meeting site objectives. Although these various programs typically share the same nominal site objectives (protection of human health and the environment, remediation of resources), programmatic differences must be considered when developing specific site objectives. The following sections present elements of the CERCLA program that define remedial action objectives (RAOs) and site objectives, followed by a discussion of differences between the CERCLA approach and approaches for RCRA sites and state remediation programs and an overview of approaches used at other Federal facilities. Incorporating GSR considerations into the project (ITRC 2011a) provides stakeholders with the opportunity to have their perspectives considered during the process of establishing the overall project’s goals and can help maximize the environmental, social, and economic benefits. USEPA administers the CERCLA remediation program. The National Contingency Plan (NCP 1990) describes the overall objective and purpose of remedial actions at CERCLA sites. According to the NCP preamble (1990), “…by stating ‘expectations’ rather than issuing strict rules, USEPA believes that critical flexibility can be retained in the remedy selection process.” Two recent USEPA publications, Memorandum: Summary of Key Existing USEPA CERCLA Policies for Groundwater Restoration (USEPA 2009b) and Groundwater Road Map: Recommended Process for Restoring Contaminated Groundwater at Superfund Sites (USEPA 2011c), both provide information relevant to the remediation process for complex sites with impacted groundwater under CERCLA and the NCP. All CERCLA site remedies must be protective of human health and the environment, as well as comply with ARARs. ARARs consist of multiple federal and state regulations. State standards that are more stringent than federal ARARs may also be applicable. The process for identifying ARARs is described in multiple USEPA guidance documents (see USEPA 2015a). Technical Impracticability. Compliance with the requirement is technically impracticable from an engineering perspective. Note that USEPA (1993) has published specific guidance on technical impracticability. Sometimes a contaminant-specific site objective cannot be reached because the remedial technology selected cannot reduce contaminant concentrations to the desired levels. USEPA (1993) guidance states that “…restoration to drinking water quality (or more stringent levels where required) may not always be achievable due to the limitations of available remediation technologies.” USEPA, therefore, must evaluate whether groundwater restoration at Superfund and RCRA groundwater remediation sites is attainable from an engineering perspective. This scenario may occur at complex sites. USEPA identified 85 sites where 91 TI waivers had been granted as of 2012; multiple TI waivers were used at some sites (USEPA 2012e). Chemical-specific ARARs for certain contaminants that cannot be achieved within a reasonable time frame due to technical challenges are then often waived. The final remedy decision document which can be a ROD, ROD amendment, or Explanation of Significant Differences (ESD), specifies the spatial (horizontal and vertical) extent of the aquifer within which the TI waiver applies (the areal footprint and depth or hydrogeologic unit, also known as the TI zone). The Koppers Oroville Wood Treatment facility operated from 1948 until 2001. Wood treatment operations and several fires contaminated the site with several wood-treatment related chemicals, including pentachlorophenol, creosote, polynuclear aromatic hydrocarbons (PAHs), as well as heavy metals including copper, chromium, and arsenic. Pentachlorophenol and creosote migrated from site soils into groundwater, where creosote DNAPL formed pools above groundwater and pentachlorophenol formed an off-site plume and contaminated a drinking water aquifer. This site demonstrates several complexities: presence of creosote DNAPL contaminating on-site groundwater, contamination of a drinking water aquifer, and widespread recalcitrant contaminants (creosote, pentachlorophenol, dioxins, and PAHs). The site remedy includes a technical impracticability waiver for groundwater in the DNAPL source area, creosote recovery, an on-site capped landfill, deed restriction, and long-term O&M. The remedial approach was refined based on success/failure of previous remedial approaches and the refined CSM. USEPA is the lead agency for the site, and the responsible party funded the cleanup. The 1989 ROD proposed several soil treatment technologies and a groundwater pump-and-treat system. The ROD proposed residential cleanup standards for soil and health-based (drinking water) standards for groundwater. However, results from soil treatability studies and additional site investigation revealed that soil treatment would not likely achieve cleanup standards. Therefore, in 1996, a ROD Amendment was issued to change the soil remedy to a capped on-site landfill and establish industrial cleanup standards for site soils. A deed restriction for site soils was subsequently established restricting future site use to industrial use. A second ROD amendment in 1999 modified the groundwater remedy to provide for a four-acre TI zone and added enhanced in situ bioremediation to the remedy. Rationale for the TI waiver approval was stated as follows: “The nature and extent of DNAPL at the site has become better defined than at the time of the RI, and technical issues regarding DNAPL are better understood than during the FS and original ROD (1989). The ROD Amendment changes the goal for groundwater from within the 4-acre TI Zone from restoration to containment. A TI waiver is justified based on the following: (1) surface and near surface soil contamination have been remediated and the DNAPL has been contained; (2) it is not technically feasible to meet the cleanup standards within the TI Zone; (3) deed restrictions can provide adequate protection; (4) contaminants will be monitored inside the TI zone; and (5) operation of P&T will be resumed as a contingent remedy if contaminants migrate outside the TI Zone. Groundwater is approximately 30 feet bgs with an estimated volume of 67 million gallons in the TI Zone. The DNAPL likely resides on three clay layers separating the different aquifers, and based on RI data, more than 1 million gallons of free creosote may be present at these layers” (USEPA 2012e).In December 1995, the off-property pump-and-treat system was shut down because monitoring results revealed that the plume had retreated upgradient of the extraction wells, and thus the system could no longer effectively capture the plume. A bioremediation program for the off-site plume was implemented in 1998 to continue advancing remedial progress. Bioremediation continued until 2009, when USEPA determined that remedial goals for off-site groundwater (restoration of drinking water) had been achieved. See the Koppers full case study for more details. TI waivers are one component of the final remedy, which may include source zone treatment, plume treatment, containment, monitoring, ICs, and engineering controls (USEPA 1993 ). A TI waiver may be considered during any stage of the remedial process. USEPA believes that, in many cases, TI decisions should be made only after full-scale interim or final remediation systems are implemented, because it is often difficult to predict the effectiveness of remedies based on limited site characterization data. TI decisions may be made at the beginning, or “front end” (USEPA 1993) of the site remediation process as part of the original final remedy. Front-end TI waiver decisions are documented in a ROD and must be supported adequately by detailed site characterization and data analyses that define critical limitations to groundwater restoration. These decisions may be based on interim remedy performance or the performance of pilot-scale studies (USEPA 1993). A postimplementation or “back-end” decision (USEPA 1993) is based on data from the remediation system and is documented in a ROD amendment or ESD. After USEPA published its primary guidance document on TI waivers in 1993, several subsequent documents reiterated and clarified the evaluation process and appropriate use of TI waivers. The USEPA Regional Administrator usually makes TI decisions, although USEPA Headquarters is typically consulted as well. A summary of key USEPA publications is provided in Table 9. 1993 Guidance for Evaluating the Technical Impracticability of Ground Water Restoration. USEPA/540/R-93/080, Office of Solid Waste and Emergency Response (OSWER) Directive 9234.2-25 Primary guidance document on TI waivers that is still used today. This document outlines USEPA’s approach to evaluating the technical impracticability of attaining required groundwater remediation standards and establishing alternative, protective remedial strategies where restoration is determined to be technically impracticable. This memorandum addressed implementation of the TI waiver 1993 guidance. The purpose of the memorandum was to promote national consistency in TI decision making, facilitate transfer of information pertinent to TI decisions between headquarters and the Regions, identify the appropriate persons to conduct reviews of TI related documents, and clarify the role of Headquarters consultation. 2007 Recommendations from the USEPA Ground Water Task Force. USEPA/500/R-07/001 The mission of the USEPA Groundwater Task Force was to identify and prioritize groundwater issues that will benefit multiple remediation programs and make recommendations to USEPA senior management on the best course of action. Among other recommendations, the task force recommended developing guidance on how to acknowledge technical limitations posed by DNAPL in USEPA remediation decisions, including updated guidance on the use of TI decisions in the Superfund program, and a discussion of mechanisms for acknowledging technical limitations posed by site complexities other than DNAPL. The report included as an attachment a discussion paper on site objectives appropriate for DNAPL source zones. 2009 Summary of Key Existing USEPA CERCLA Policies for Groundwater Restoration. The purpose of this memorandum is to provide a compilation of some key existing USEPA groundwater policies to assist USEPA regions in making groundwater restoration decisions pursuant to CERCLA and the NCP. This memorandum did not create any new guidance. Among other things, the memo addressed expectations for groundwater restoration and TI waiver consideration in the context of principles for groundwater remediation. 2011 Memorandum titled “Clarification of OSWER’s 1995 Technical Impracticability Waiver Policy” OSWER Directive #9355.5-32. The purpose of this memorandum is to provide clarification to the 1995 OSWER memorandum entitled “Superfund Groundwater RODs: Implementing Change this Fiscal Year” regarding the use of TI waivers at CERCLA sites with DNAPL contamination. This memorandum clarifies that (1) the 1995 memorandum was intended to apply only to remedy decisions made in FY 1995 and that (2) DNAPL contamination in and of itself should not be the sole basis for considering use of a TI waiver at any given site. Groundwater at Superfund Sites. OSWER Directive 9283.1-34. This fact sheet focuses on those groundwater response actions in which the decision has been or may be made to restore all or part of the aquifer and that are undertaken using remediation authority under CERCLA, as amended. Portions of this guidance may also be useful for groundwater remedial actions that do not have restoration as an objective. The document does not provide new guidance but compiles key relevant highlights of Superfund law, regulation, policy, and guidance. 2012 Summary of Technical Impracticability Waivers at National Priorities List Sites. Report with General Technical Impracticability Site Information Sheets. OSWER Directive 9230.2-24. This report provides a summary of TI waivers issued by USEPA regions, and brief summaries of the completed TI waiver decisions, including a summary of the site conditions and the Regions’ rationale for adopting a TI waiver. A total of 91 waivers at 85 sites were identified. 2014 Groundwater Remedy Completion Strategy: Moving Forward with the End in Mind. OSWER 9200.2-144. This document presents a recommended “groundwater remedy completion strategy” for evaluating Superfund groundwater remedy performance and making decisions to help achieve RAOs and associated remediation standards. Section 7 of this document, “Make management decisions,” describes some of the key options to consider if it appears that a remedial action will not be able to achieve the groundwater RAOs and associated remediation standards selected in the ROD. Greater Risk. Compliance with the requirement would result in greater risk to human health and the environment than other alternatives. CERCLA sites adopting ARAR waivers based on greater risk did so in the late 1980s and early 1990s. The Superfund ROD database for “greater risk” shows no recent CERCLA sites referencing a greater risk ARAR waiver from 2000 to 2012. Although this type of waiver may have been recently considered at complex sites, there are no recent examples of its successful adoption and integration into a CERCLA decision document. Equivalent Standard of Performance. The alternative will attain a standard of performance that is equivalent to that required under the otherwise applicable standard, requirement, or limitation through use of another method or approach. This type of ARAR waiver is appropriate if “the alternative will attain a standard of performance that is equivalent to that required under the otherwise applicable standard, requirement, or limitation through use of another method or approach” (40 CFR 300.430(f)(1)(ii)(C)). No CERCLA sites have used this ARAR waiver since 2000, although the use of this waiver was considered during the FS at one site (USEPA 2002c). Prior to that, this type of waiver was used to waive action-specific and location-specific ARARs and was not applied to ARARs for contaminated groundwater. For example, RCRA landfill cap requirements have been waived based on equivalent standard of performance of an alternative landfill cap design (Deeb et al. 2011). This type of waiver applies if “with respect to a state requirement, the state has not consistently applied, or demonstrated the intention to consistently apply, the promulgated requirement in similar circumstances at other remedial actions within the state” (40 CFR 300.430(f)(1)(ii)(C)). This waiver was intended to prevent the state from imposing unjustified or unreasonable restrictions at CERCLA sites. No CERCLA sites have used this type of ARAR waiver. Considerable discussion of an ARAR waiver based on inconsistent application of state standards is documented in the Rocky Mountain Arsenal off-post operable unit ROD. Interested parties discussed waiving Colorado Basic Standards for Groundwater that had been adopted contemporaneously with the ROD for contaminants unique to the site. However, an ARAR waiver was never used (Deeb et al. 2011). Fund Balancing. For Fund-financed response actions only, an alternative that attains the ARAR will not provide a balance between the need for protection of human health and the environment at the site and the availability of Fund money to respond to other sites that may present a threat to human health and the environment (USEPA 1991). This ARAR waiver is appropriate if the cost of complying with the ARAR is high enough to threaten the ability of the CERCLA Fund to respond to and achieve protectiveness at other sites (USEPA 1991). The waiver is only to be considered at CERCLA sites that receive Superfund financial support. There is no set dollar amount at which this waiver should be invoked. In 1991 guidance, USEPA stated that “the fund-balancing waiver is to be routinely considered when the cost of meeting an ARAR for an operable unit is four times the national average cost of remediation of all operable units.” Previously published USEPA guidance had stated that the “waiver should be considered when the cost of attaining an ARAR is 20 percent of the annual remedial action budget or $100 million, whichever is greater” (USEPA 1989a). Regardless of these details, the fund-balancing ARAR waiver has never been used in practice. An option for this waiver, however, remains open in the ROD for the Upper Tenmile Creek Mining Area. This ROD stated that although the intention of the final remedy was to fully attain water quality standards, USEPA would consult with the state during the five-year review process to assess whether a Fund-Balancing ARAR waiver was appropriate in the future to waive specific standards in particular stream reaches or groundwater areas (USEPA 2002d). Interim Measure. The alternative is an interim measure and will become part of a total remedial action that will attain the applicable or relevant and appropriate federal or state requirement. ARARs are not expected to be met if “the alternative is an interim measure and will become part of a total remedial action that will attain the applicable or relevant and appropriate federal or state requirement” (40 CFR 300.430(f)(1)(ii)(C)). Interim measures can therefore function as temporary ARAR waivers at complex sites until agreement is reached on the final remedy. For example, interested parties at the Hastings Groundwater Contamination site area-wide groundwater operable unit (OU 19) issued an interim ROD in 2001 because they were unable to reach agreement on a final ROD. None of the remedial alternatives were expected to meet ARARs, yet data were not deemed sufficient to support an ARAR waiver based on technical impracticability (Deeb et al. 2011). Therefore, interested parties issued an interim ROD which stated that monitoring would be conducted and used as a basis for assessing technical impracticability or ACLs as part of a final ROD. Subsequent five-year review reports have not further commented on the potential use of an ARAR waiver or ACLs. The 2012 five-year review report states that a final ROD is still needed. This situation is likely common at other complex sites operating under interim remedies. The remedial action includes enforceable measures that will preclude human exposure to the contaminated groundwater at any point between the facility boundary and all known and projected points of entry of such groundwater into surface water then the assumed point of human exposure may be at such known and projected points of entry. In addition to meeting these three criteria, USEPA published a policy memorandum stating several other factors to consider before establishing an ACL (USEPA 2005b). Examples include whether all groundwater plumes are discharging to surface water and the potential accumulation or effect of degradation byproducts in groundwater or surface water (USEPA 2005b). A keyword search of the CERCLA database revealed no sites using ACLs since 2005 and one site at which ACLs were rescinded based on the USEPA memorandum, with a TI waiver issued instead (Deeb et al. 2011). Most remediation sites in the United States are not under the jurisdiction of the CERCLA remediation program, but instead are identified and administered by states and territories under the RCRA Corrective Action program, Brownfields and Land Revitalization programs, Underground Storage Tank remediation programs, and Voluntary Cleanup programs. The RCRA Corrective Action program regulates the remediation of nearly 4,000 active hazardous waste management facilities with spills or releases. USEPA has generally delegated RCRA program management to the states (43 of the 54 states and territories are authorized). Like CERCLA, the overall goal of RCRA and its implementing regulations is to protect human health and the environment, meet site objectives, control sources to reduce further release of hazardous waste, and comply with applicable standards for waste management. Remediation programs have typically been designed to achieve specified site objectives for groundwater, sometimes point-based concentrations below federal MCLs or similar drinking water quality criteria, before site closure is allowed. Several regulatory-approved approaches for setting site objectives in groundwater, however, can be used as an alternative to MCLs (NRC 2013). It is beyond the scope of this document to comprehensively describe the different state and federal remediation program approaches to setting or revisiting site objectives. Instead, this guidance presents results from a survey of ITRC state Points of Contact (POCs) and offers several examples of goal-setting under these remediation programs. To gauge state regulatory practices regarding site objectives, ITRC surveyed the ITRC state POCs. Survey results indicated that several methods were commonly used as a basis for setting or revisiting site objectives. The term “RAOs” was used in the survey to encompass a broad range of state remediation program objectives (site objectives). Several methods of designating alternative points of compliance, contaminant management areas (areas subject to institutional controls, plume containment), criteria adjustment, schedule adjustment, technology adjustment, and other alternatives were then listed. Note that the second survey question referred to a “planned remedial time frame”; however, there is little evidence that states or tribes establish a planned remedial time frame during remedy selection. With this qualifier, the results of the survey are summarized below. ITRC received responses from 40 of the 50 states (see Appendix A for detailed results). Results for the first question are summarized in Figure 3, ordered by frequency of use of the different alternative compliance options/adjustments. Results for the second question are shown in Figure 4. Figure 3. State survey responses to Question 1: Does your state/tribal program allow the following as a primary means to meet RAOs? Figure 4. State survey responses to Question 2: Does your state/tribal program allow the following after the original selected remedy fails to reach the RAOs within the planned remedial time frame? Almost all the states responding to the survey allow for the use of site objectives based on risk assessment as a primary means of adjusting site objectives. Most also allow for site objectives adjustments due to regional background concentrations. States may have specific guidance for determining background concentrations or may reference USEPA (2002b) CERCLA guidance. 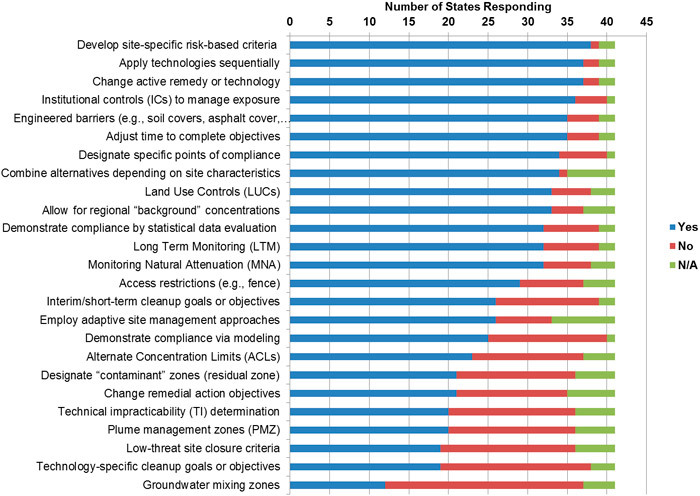 In contrast, only about half of the states responding indicated that site objectives could be adjusted by changing site objectives, using ACLs, issuing TI determinations, designating plume management zones or plume containment zones, or adopting interim objectives. Note that some states (such as Alaska) may not have formal guidance or policy on TI determinations, but instead refer to requirements for cleanup to the lowest extent practicable or allow a demonstration that a prescribed cleanup level is not practicable. States indicated that contaminant management approaches (ICs, engineered barriers, land use controls (LUCs), and access restrictions) are commonly used as a primary means of meeting site objectives. Adjustments to schedule and technology selection were also commonly used as a primary means of meeting site objectives. Applying several technologies sequentially, changing the remedy, and adjusting the time planned to reach the site objectives were used by 85% to 90% of the states who responded to the survey. At sites where the original remedy failed to meet site objectives within the planned time frame, many states indicated that several approaches were then more likely to be considered. Six more states indicated that a TI determination could then be considered; another six states replied that they could then change site objectives. Five states accept a demonstration of compliance based on modeling. Several more states would consider adopting LUCs, access restrictions, engineered barriers, ICs, and long-term monitoring. Two states consider designated contaminant zones or MNA and one additional state would consider interim objectives, groundwater mixing zones, ACLs, compliance based on statistical data evaluation, technology-specific objectives or would then adjust the time frame to reach site objectives. Note that the results of this survey cannot be used to make conclusions about using these approaches at CERCLA sites. Additionally, an individual state remediation program may accept an approach that is not necessarily accepted statewide. State regulators should be consulted regarding the applicability of any of these remediation management approaches at a specific site. Most practitioners are familiar with using site-specific criteria in a risk assessment process to develop site-specific risk-based criteria as site objectives. As shown in the ITRC survey, nearly all state programs have regulatory flexibility to accept site-specific, risk-based criteria in place of published screening levels. State regulators should be consulted regarding the potential use of site-specific criteria at a particular site. The risk assessment process is the basis for remediation at RCRA sites. Although most investigation and remedial actions use risk-based screening levels published by the state, site-specific risk and exposure criteria have been used as the basis for remediation requirements at several complex sites. One state survey responder commented that DOD sometimes prepares detailed risk assessments at more complex sites. For these sites, the state also required the evaluation to address nontoxicological effects of contaminants such as flammability, leaching, odor/nuisance concerns, and impacts to aquatic habitats. Site-specific risk assessments have also been conducted to address newly-identified exposure pathways such as vapor intrusion (see Case Study 2). Several guidance documents provide more information on how to conduct a site-specific risk assessment (ITRC 2015a, 2008c, NRC 2014). Groundwater management zones (GMZs) were used at an Illinois Superfund site to identify areas that do not currently meet drinking water standards. GMZs restrict the use of groundwater and other activities to prevent human exposure to contaminated groundwater. Monitoring wells between the plume and the GMZ boundary provide early warning of plume migration and serve as points of compliance. GMZs include a buffer zone outside of the plume to prevent well installation. At JOAPP, GMZ borders were extended in response to a five-year review to prevent groundwater withdrawals from within the GMZ. The designation will be in place until site objectives have been achieved. More details are provided in the full case study. Designating specific points of compliance (for example, specific monitoring wells) is another approach that has been accepted as the basis for site objectives. According to the ITRC state survey, approximately 75% of state remediation programs have the flexibility to accept this approach to meeting site objectives. State responders commented that the flexibility to accept designated points of compliance depended on the regulatory program involved. Several survey responders emphasized the need for the compliance locations to be within the property boundary; off-site compliance locations were not acceptable. Another survey responder commented that specific locations were also commonly designated as monitoring locations (for example, sentinel wells) to define the restricted area under ICs. Similarly, designated sentinel wells could be used as a trigger for determining whether to implement a contingency plan. Compliance points can be used in a long-term management monitoring program to also detect external changes that may affect the basis of site-specific risk assumptions or exposure assumptions (such as the effect of a rising water table, or geochemical changes that may affect an MNA remedy). Finally, note that compliance locations within a specific boundary or plane can be used to calculate mass flux; therefore, a designation of specific points of compliance opens the door for consideration of flux-based criteria for evaluating progress towards site objectives. Points of compliance were recently documented in a ROD at a Superfund site in Massachusetts (USEPA Region 1). A “Potentially Productive Aquifer” (potential drinking water source) was present within the site boundaries. Several source areas (prior areas of disposal) were located throughout the site and over the aquifer, making it nearly impossible to meet MCLs. The aquifer is also within an area that is zoned for industrial use, however, so it is highly unlikely that a drinking water well would ever be installed. USEPA and MassDEP agreed that the groundwater within site boundaries did not need to meet drinking water standards, but would do so at a “Point of Compliance” that was just beyond the site and beyond the source areas. Several sites have used surface water quality criteria in conjunction with dilution calculations, mixing zone modeling, fate and transport modeling, or a combination of these approaches to determine the numerical value of the ACL for groundwater. Note that Florida does not allow surface water dilution unless it is shown to be acceptable via an ecological risk assessment. Instead, compliance with surface water standards is to be met in groundwater prior to surface water recharge pursuant to 376.30701(2)(g)2, Florida Statutes. Other groundwater ACLs have been determined based on site-specific risk assessments (Deeb et al. 2011). Several states allow for site-specific criteria to be adopted as site objectives. For example, Tennessee Code Title 68, Chapter 215-127(b) requires that all petroleum-contaminated sites in Tennessee be subject to soil and groundwater classification and site objectives established under the provisions of the Petroleum Underground Storage Tank Act. The Division of UST regulations established site objectives for the specific gasoline constituents as well as for various parameters based on the type of petroleum/petroleum product released. The initial screening limits are largely based on whether the site is in a drinking water or non-drinking-water area. According to the General Water Quality Criteria Rules Chapter 0400-40-03-.07(4)(b), all groundwater in Tennessee is considered general use groundwater. However, based on the Tennessee Petroleum UST Act (68-215-127 et seq.) and the exclusivity provisions provided in this Act, Section K of the Division of UST environmental assessment guidelines is used in determining if petroleum contamination constituents in groundwater are to be considered under the drinking water or nondrinking water classification. If the chemicals of concern exceed the non-drinking water standards, then establishing a site objective based on the Division of UST TGD-017 would be done prior to remediation activities. Several states have provisions similar to a TI waiver. During the state POC survey, the following 29 states indicated that TI determinations could be used to create alternative points of compliance: Alaska, Arkansas, California, Colorado, Connecticut, Washington DC, Delaware, Florida, Hawaii, Illinois, Iowa, Kentucky, Louisiana, Minnesota, Missouri, Montana, Nebraska, Nevada, New Jersey, New Mexico, North Carolina, Pennsylvania, Puerto Rico, Rhode Island, South Dakota, Texas, Utah’s CERCLA program, Vermont, and Virginia. Utah indicated that TI determinations were not accepted under the UST/LUST program. Eleven other states (Alabama, Arizona, Georgia, Kansas, Maryland, Mississippi, New York, Oregon, South Carolina, Tennessee, and Wisconsin) indicated that TI determinations not accepted or were not applicable. The New Jersey Department of Environmental Protection (NJDEP) Site Remediation Program recently published a guidance document to help responsible parties determine whether, when, and how to seek a TI determination for groundwater contamination (NJDEP 2013). A TI determination is accompanied by a Classification Exception Area (CEA) and a groundwater remedial action permit, per New Jersey Code of Regulations. The purpose of CEAs in New Jersey is to provide ICs for the use of groundwater in and around the areas where groundwater contamination exceeds applicable NJDEP Ground Water Quality Standards. …potentially responsible parties may demonstrate in the CAS [Corrective Action Study] that compliance with the preliminary RECAP [Risk Evaluation/Corrective Action Program] standards is technically infeasible and may propose alternative preliminary RECAP standards. The development and evaluation of alternatives in the CAS shall reflect the scope and complexity of the site problems being addressed. Control the source of release so as to reduce or eliminate, to the extent practicable, further releases of hazardous waste or hazardous constituents that may pose a threat to human health and the environment. Ensure that remaining contaminants are stable and not migrating beyond a designated regulatory boundary at concentrations of concern. Contaminants may remain in the groundwater where exposure is unlikely (for example, beneath a parking structure or active gas station). Groundwater may remain contaminated where free-phase and dissolved-phase plumes are stable, the designated beneficial use of the groundwater is not impaired, and adverse effects (for example, vapor intrusion) to on-site or off-site structures are unlikely. At least three states—Virginia, California, and Colorado—recently developed policy or guidance to move sites to closure following partial cleanups without achieving complete cleanup of soil or groundwater. For these sites, MCLs are not achieved and, in some cases, free-phase hydrocarbons are left in place. These states use similar approaches to achieving site objectives for partial cleanup. Releases from tanks or other containment systems commonly result in contamination of ground water. Once the source of contamination has been neutralized or eliminated, decisions regarding the necessity of and extent to which ground water must be remediated should be based upon a combination of risks and applicable remedial technologies. Groundwater is not necessarily a receptor, but rather a medium through which constituents may migrate to a receptor. Section 5.5 of Virginia’s technical guidance notes that “Section 9 VAC 25-580-270 of the UST Technical Regulation requires the removal of free product to the maximum extent practicable.” The Virginia Department of Environmental Quality issued guidance in December 2011 to identify those cases in which continued attempts to reduce free product to an arbitrarily measured thickness (for example, 0.01 feet) is neither practicable or even necessary, or in which continued recovery of product beyond a practicable achievable thickness may provide little or no positive environmental protection. The unauthorized release is located within the service area of a public water system (thus it is unlikely that new water supply wells will be installed in developing areas and inadvertently contaminated). The unauthorized release consists only of petroleum. The unauthorized (primary) release from the UST system has been stopped. Free-phase product has been removed to the maximum extent practicable. A CSM has been developed that assesses the nature, extent, and mobility of the release. The secondary source has been removed to the extent practicable. Nuisance as defined by Water Code section 13050 does not exist at the site. The policy further identified certain conditions for sites where a groundwater beneficial use does exist, but where closure may still be appropriate with groundwater contamination present. For example, there can be no free-phase product present. The criteria depend on distance of the release from supply wells, the size of the dissolved-phase plume, and the concentrations of petroleum contaminants within those plumes. Criteria for dissolved-phase concentrations range, depending on other conditions at the release site, but are significantly greater than MCLs (such as 1,000 to 3,000 micrograms per liter for benzene). Finally, the policy requires site managers to notify local water districts, planning authorities, and affected and neighboring property owners, as well as the public through a 60-day comment period. In October 2014, Colorado’s Hazardous Materials and Waste Management Division published its “Policy for conditional closure of low threat sites with residual groundwater contamination” (CDPHE 2014b). The policy does not apply to regulated RCRA sites or NPL sites. Sites are granted conditional closure rather than no further action. The Colorado policy applies at sites where the source area has been remediated to the extent practicable, plume size is stable or decreasing, and the concentrations are decreasing or are predicted to decrease in the absence of an engineered remedial system. In addition, the applicant must demonstrate that the remaining contaminant will not likely cause human or environmental exposures. ICs are typically required. The policy notes that the applicant is expected to demonstrate that the decreasing concentrations will achieve a remediation goal “within a reasonable time frame” after conditional closure, that ICs apply on site and off site if the plume has migrated beyond the property, and that reasonably anticipated future land use (and groundwater use) should be considered. Public notification is required to all property owners and occupiers within the plume. Tier III closure can be granted when petroleum concentrations exceed Tier I risk-based screening levels beyond the site boundary, but not across an adjoining roadway. Impacted media must be remediated to achieve Tier I or II concentrations (described below) before a Tier III closure will be considered. OPS will formally notify the roadway owner and the Utility Notification Center of Colorado with the address details of all Tier III closure sites to protect workers from exposure during future construction or maintenance activities. A Tier IV closure can be granted at sites that no longer have storage tank systems and where dissolved-phase contamination has migrated to adjacent properties and is defined by downgradient point-of-compliance monitoring wells. Contaminant mass must first be removed to the maximum extent practicable. As with Tier III closures, OPS will formally notify the off-site property owners and record the closure address with the Utility Center. Tier I allows closure if all concentrations in soil and groundwater are below Tier I risk-based screening levels. Tier II allows closure of sites with concentrations above Tier I levels, but where site-specific modeling can be used to show that Tier I levels will be achieved at an on-site point of compliance closer to the release than the nearest point of exposure. LNAPLs must be removed to the maximum extent practicable. DOD and DOE have lead agency authority for cleanup conducted under CERCLA authority per Executive Order 12580 as amended. The process for setting site objectives at RCRA and CERCLA federal facilities follows RCRA and CERCLA guidance. Case studies of federal sites were described in an ESTCP publication on alternative endpoints (Deeb et al. 2011). As of March 1, 2016, these programs include 157 federal NPL sites and 4 more proposed NPL sites (USEPA 2016e). There are approximately 200 RCRA Corrective Action sites at federal facilities (USEPA 2013d). Rocky Mountain Arsenal (RMA), Colorado, has a long history of regulatory and legal involvement. A Supreme Court ruling on RMA recognized the state’s newly delegated RCRA authority to enforce state environmental laws at federal facilities. Currently, USEPA, the state of Colorado, and the Tri-County Health Department provide ongoing oversight of RMA as it transitions from active remediation to long-term O&M. Following multiple interim response actions focused on contaminant removal, remediation, and containment, the selected final remedy at RMA addresses multiple contaminants of concern in 15 separate plumes, with institutional controls and land reuse as a wildlife refuge. More details are provided in the full case study. Federal facilities also have sites under the Installation Restoration Program to address contamination at active installations, Formerly Used Defense Sites (FUDS) and Base Realignment and Closure (BRAC) locations. These projects advance the goal of cleaning up sites so that they are safe for human health and the environment, as well as returning these properties to productive reuse. Per the Base Realignment and Closure Act of 1988 and the Defense Base Closure and Realignment Act of 1990, DOD must comply with a variety of environmental laws, including RCRA and CERCLA. NEPA also has requirements that must be met when DOD transfers property. In 2001, DOD also established a Military Munitions Response Program (MMRP) to address sites with unexploded ordnance, discarded military munitions, and munitions constituents (MC). Developing interim objectives as part of an adaptive site strategy includes selecting the remedial strategy (which may be comprised of multiple phases and technologies), identifying components of each remedial approach, setting interim objectives, and documenting the selected remedial strategy. Interim objectives include short-term or technology-specific interim objectives and metrics to guide progress towards site objectives. These topics are usually considered during remedy planning or when the existing remedial strategy performance is not on track to meet interim objectives despite optimization. The CSM should be up-to-date prior to establishing interim objectives, because inaccuracies in the CSM can affect technology implementation and performance monitoring. Original objectives may need to be revised based on new information. The concepts of applying interim objectives, optimization activities, and assessing performance relative to expectations are all aspects of adaptive site management (Figure 1) and can be incorporated into potential remedial approaches. Additional resources for decision makers in developing interim objectives as part of potential remedial approaches include USEPA guidance for optimization and phased remediation (USEPA 1990, 1992, 2004c); see also CLU-IN optimization guidance, USEPA guidance for documenting remedy changes (for example, USEPA 1990, 1999a), and the ITRC IDSS guidance (ITRC 2011b). whether any predictive analysis of remedy performance is needed to support the selection of the remedial approach or provide a baseline for evaluating performance after implementation (see tools in Appendix B). The comparative evaluation of potential remediation strategies typically uses some form of weighting that creates a combined evaluation for each potential remedial approach based on how well the potential remedial approach meets the individual evaluation criteria. Following this comparative evaluation and discussion of considerations outlined in pertinent regulatory guidance, one of the potential remedial approaches is typically recommended and selected for implementation. Recommended strategies are subject to modifications based on input from the public and regulators following the remedy selection process mandated by the regulatory remediation program. To determine the most appropriate remediation strategy, the components needed to achieve the strategy must be identified. The term “components” refers to remediation technologies, containment methods, institutional controls, and any other technical or management approaches that can be used in combination at a site in order to address the site objectives. Potential remedy components are listed in Table 10. Key resources for information about these components include the USEPA CLU-IN website (USEPA 2017b), the Federal Remediation Technology Roundtable (FRTR 2016), the Naval Facilities Engineering Command website (NAVFAC), and the Center for Public Environmental Oversight website (CPEO 2010). In Situ Chemical Treatment Applying an amendment into the aquifer to chemically remediate a targeted volume of the aquifer. General categories of treatment include in situ chemical oxidation (ITRC 2005, USEPA 2012c, 2006a), and in situ chemical reduction. Passive Hydraulic Barrier Installing impermeable materials in the subsurface to alter groundwater flow patterns. Phytoremediation may also be used as a passive hydraulic barrier or as a method to lower the groundwater table (see general sources such as CLU-IN (USEPA 2017b)). A complex site may be divided into multiple segments (for instance, source and plume, sands and clays, on-site and off-site contamination) and components of the remedial approach can be identified for each segment. Table 11 provides an example of how options can be identified for each component of the remedial approach and site segment. Table 11 also identifies the potential remedy components for a hypothetical site and illustrates how a similar site-specific table could be used. The Paducah Gaseous Diffusion plant (PGDP) employed a “combined remedy” approach to address TCE and Technetium 99 plumes in low- permeability, fine-grained sediments as well as a deeper regional aquifer. Proven and innovative technologies were selected as an interim action to achieve source remediation, hydraulic control, and natural attenuation. Technologies include electro-thermal heating (known as the Lasagna process), electrical resistive heating (ERH) with SVE, groundwater extraction and treatment and optimization over time, and MNA. See the full case study for more details. When compiling candidate remediation approaches, it may be useful to develop a conceptual design for each option to describe how it could be configured and to evaluate the predicted performance and viability as part of an adaptive remedial strategy (see tools in Appendix B). Candidate remedial approaches can be developed using remedy components identified for specific site segment. When assembling remedy components into viable candidate remedial approaches, it may be useful to vet each remedial approach by considering its value in advancing the site towards achieving its objectives and managing contamination during that time. As shown in Figure 1, this process of remedy evaluation may be repeated as appropriate as the remedy progresses, until long-term site objectives are reached. Note that optimization is not typically the focus of adaptive site management, but is often appropriate as part of the adaptive site management process. The selected remedial approach is documented by describing each component of the remedial approach, articulating how the components of the remedial approach work together, setting interim objectives associated with each component of the remedial approach, and listing performance metrics that can guide evaluations of remediation progress. Documentation should clearly state how the performance of each component will be evaluated to meet interim objectives (see tools in Appendix B). This type of documentation describing how the remedial approach will be implemented can facilitate the transition to remedy design, implementation, and long-term management. Documentation is subject to the requirements of the site’s regulatory program. When documenting the interim objectives and remedial approach, consider ways to incorporate flexibility into the remedial system design to provide opportunities to optimize or enhance the system performance without special approval for significant system modifications. For example, flexibility to redirect or adjust extraction and injection rates at various monitoring wells can maintain an effective dynamic groundwater recirculation program. The remedial approach may include adaptive design elements. For example, a remedial strategy may plan to use multiple technologies in combination or sequentially, guided by technology performance. If the remedial strategy incorporates multiple technologies, documentation can also include a site-specific process and metrics to evaluate when and how to transition from one technology to the next. For example, CERCLA decision documents can specify a contingency remedy as part of the final remedy with guidelines or criteria on when the contingency remedy would be considered for implementation. More detail on establishing performance metrics and evaluating performance is provided in this guidance, along with details on strategy adaptation guided by performance. Upon reaching asymptotic performance, NRC (2013) suggests that transition to MNA or some other management approach be considered using this transition assessment. The transition assessment is similar to a focused feasibility study (FFS) and considers alternatives for site management—choosing a new remedy or transitioning to long-term management or other alternative site objectives (Deeb et al. 2011). The transition assessment concept is consistent with the adaptive site management concept developed in “Environmental Cleanup at Navy Facilities: Adaptive Site Management” (NRC 2003), but focuses specifically on complex sites where long-term management will be a likely component of any remedy completion strategy. Asymptotic behavior is a key concept for evaluating remediation performance. Remediation metrics such as mass removal versus time or concentration versus time curves are often evaluated to see if these metrics are approaching an asymptote. Technology performance at complex sites may reach asymptotic behavior, and interim objectives and performance metrics can be based on this behavior. For example, a hypothetical site may use asymptotic performance as an interim objective and state that interim objective as follows: “Begin groundwater restoration at source area within three years and continue O&M until asymptotic performance is reached.” In 2013, the NRC suggested that asymptotic behavior applied to plume behavior (for example, groundwater concentration versus time) or remedy performance (mass removal versus time) could be a key trigger for conducting a transition assessment. While asymptotes are fundamental to evaluating remediation performance, one case study highlights that merely reaching an asymptote is not sufficient to suspend remediation activities. The MEW site in California experienced a 65% reduction in mass removal over a 12-year period, but the decrease was not indicative of “asymptotic conditions” nor did it indicate that the remedy is less effective than anticipated in the ROD. In general, asymptotic behavior in performance metrics is less meaningful at sites where the overall goal of the remediation system is containment or control. But at sites where the key metrics are mass removal, mass removal to reduce the remediation timeframe, or concentration reduction, then having these metrics reach asymptotic behavior is an important trigger for considering optimization or a potential transition. NRC’s transition assessment is relevant to complex sites because these sites may not achieve site objectives in a reasonable time frame, and remedial efforts may eventually reach the asymptotic performance considered by the NRC as indicating a need for a transition assessment. While not specifically mentioned by NRC, monitoring after a remedy is turned off can detect aquifer rebound dynamics and clarify fate and transport mechanisms that can improve the CSM and subsequent remedies. Documentation of interim objectives and the remedial approach should describe how protectiveness of human health and environment will be maintained. This element of a remedy is common to CERCLA, RCRA, and other state and federal regulatory remediation programs. This protection is especially important at complex sites, where long time frames are required for remediation. Including protective elements such as ICs and LUCs as part of the remedy approach and these elements should be integrated into a long-term management approach. State survey results highlighted that ICs and LUCs are commonly accepted components of remedial strategies to prevent exposure until groundwater standards are met. Examples of ICs and LUCs include deed restrictions (with landowner concurrence), fish advisories, and fencing. However, ICs and LUCs are rarely approved as stand-alone remediation strategies and are not a driver for changing site objectives or a substitute for remediation. Maintaining and monitoring ICs and LUCs over long time frames are addressed when planning for long-term management of a complex site. In Long Term Contaminant Management Using Institutional Controls (ITRC 2016b), ITRC has identified critical elements of an effective ICs management program based on successes from established state and federal agency programs, along with other available innovative tools. In developing this guidance, ITRC surveyed state programs and determined what kinds of IC programs are in place across the country, what makes these programs effective, and what common issues affect the durability of ICs. This information can assist decision makers with developing, improving, and stewarding ICs over long time frames. In order to best apply ICs, ITRC also developed a tool to help create a long-term ICs stewardship plan tailored to a specific site (ITRC 2016b). This guidance is relevant to state, federal, and tribal agencies, municipal and local government, private and public/governmental responsible or obligated parties (OPs), current site owners and operator, environmental consultants, and prospective purchasers of property and real estate agents. Additionally, stakeholders who have an interest in a property will find this guidance helpful in understanding the elements required to manage ICs throughout the life cycle (ITRC 2016b). Because the IC guidance focuses on long-term management of ICs that are already in place, it does not address the details of selecting ICs. Properly selecting and implementing ICs, however, is essential for the long-term durability and effectiveness of a remedy. The guidance summarizes some of the key components that should be considered when choosing ICs, including decision-making aspects of IC implementation and planning that can affect the long-term durability of an IC, with links to additional guidance on IC selection.